In the current Torah portion Emor, we are instructed to abstain from work on Shabbat—every seventh day. Next week’s Torah portion, Behar, continues this theme and instructs us to abstain from agricultural work every Sabbatical year, Shmita. And the Torah doesn’t stop there. It instructs us to count seven Shmitas and then observe a Jubilee, Yovel. What is common here is self-similarity on different scales—number seven plays a role of a period of a multidimensional spiral with multiple periods: seven days, seven years, seven shimitas, seven millennia, seven Cosmic Shmitas… In mathematics, such patterns are called fractals. A fractal, by definition, is a pattern that repeats itself on every scale. This property is called self-similarity. We divide the line segment into three segments of equal length. Then we draw an equilateral triangle that has the middle segment from step 1 as its base and points outward. Finally, we remove the line segment that is the base of the triangle from step 2. We repeat this process ad infinitum. You can’t help but notice that the second iteration of the algorithm produces the Star of David, Magen David. An amazing property of the Koch snowflake is that it has a finite area bounded by an infinitely long line. Sierpinski Triangle. This fractal is an equilateral triangle, subdivided recursively into smaller equilateral triangles. We subdivide it into four smaller equilateral triangles and remove the central one. Then we repeat step 2 with each of the remaining smaller triangles, and so on. 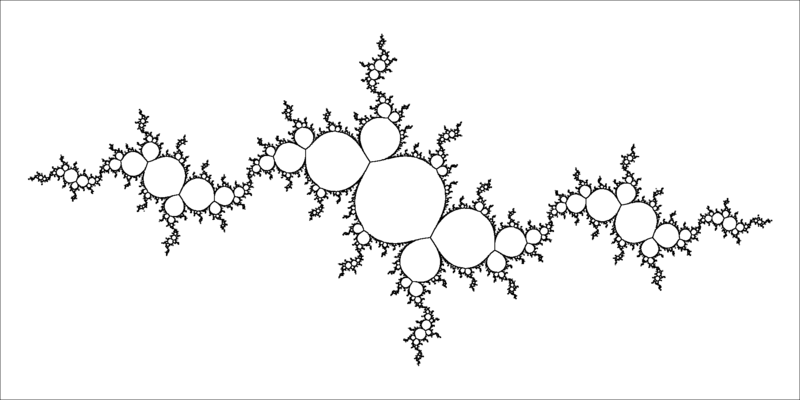 The angle between any two neighboring line segments is the same throughout the fractal. The ratio of lengths of any two consecutive line segments is constant. Points all the way at the end of the smallest line segments are interconnected. Fractal shapes exist not only in mathematics, they are all around us. 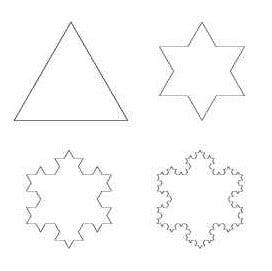 Jewish mathematician Benoit Mandelbrot noticed that much of nature has fractal shape—be that a maple leaf, cauliflower, mountains, coastline, lungs, or blood vessels—they all share one property, self-similarity on various scales. (A few years ago, I hypothesized that our spacetime, while smooth on a large scale, must be fractal on micro-scale. If true, this fractal “roughness” on a small scale may be able to bridge the gap between general relativity and quantum field theory.) Fractals are ubiquitous in nature. Why is that? It seems to me that the reason for that lies in the structure of sefirot in the world of Tikun (Rectification). Sefirot—divine emanations that are the “building blocks” of creation—are the underlying conceptual framework of the entire creation. While in the world of Tohu (Chaos) sefirot are disjointed, which led to shevirat hakelim (breaking of the vessels), in the world of Tikun they are inter-included, i.e., each sefirah includes all ten sefirot. Thus, Chochmah includes all ten sefirot: Chochmah of Chochmah, Binah of Chochmah, Daat of Chochmah, Chesed of Chochmah, Gevurah of Chochmah, Tiferet of Chochmah, Netzach of Chochmah, Hod of Chochmah, Yisod of Chochmah and Malchut of Cochmah. Ten sefirot branch out into 100 combinations. We are now in the days of counting Omer, when each day we repair a particular combination of seven midot (seven lower sefirot) counting Chesed of Chesed, Gevurah of Chesed, etc.—49 permutations in total. 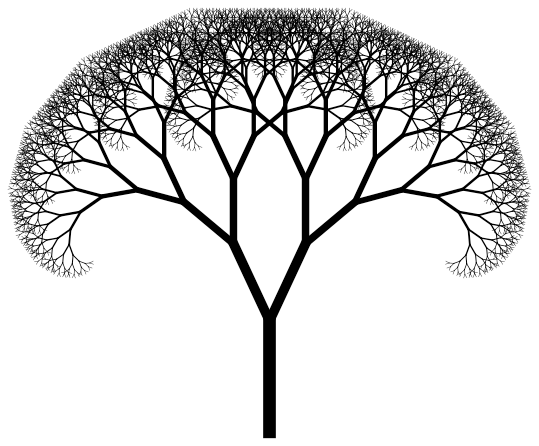 Each of the 100 combinations, in turn, further includes each of the ten seferiot resulting in further branching of the sefirotic tree, ad infinitum. This is a perfect fractal structure. No wonder that the physical world, reflecting its spiritual origin, exhibits similar fractal patterns. Whereas nature furnishes plentiful examples of fractal patterns in space, the Torah shows us a unique fractal pattern in time and in the spiritual domain. Another fractal pattern unique to Torah is found in one of the tools of biblical hermeneutics—gematriah. In Hebrew, the numbers are written using the letters of the Alef Bet: 1 is Alef, 2 is Bet, etc. Thus, every Hebrew letter has a numerical value, gematriah. To calculate the gematriah of a Hebrew word, one adds the numerical values of all letters spelling out that word. For example, the word achad (one) is spelled Alef-Chet-Dalet. The numerical values of these letters are: Alef=1, Chet=8 and Dalet=4. Thus, the gematriah of ahad is 1+8+4=13. However, each letter has its name and, therefore, its own gematriah: Alef is spelled Alef-Lamed-Peh, so it’s gematriah is 1+30+80=111. Chet is spelled Chet-Yud-Tav, so its gematriah is 8+10+400=418. Dalet is spelled Dalet-Lamed-Tav, so its gematriah is 4+30+400=434. Expanding each letter of the word achad with the spelling of each letter gives Alef-Lamed-Peh-Chet-Yud-Tav-Dalet-Lamed-Tav, so the expanded gematriah of achad is 111+418+434=963. Such gematriah is called milui (filled). Each letter in the expanded—milui spelling can, in turn, be spelled out again, ad infinitum. Once again, we have a fractal pattern. In turn, each of these levels also has five levels, so that we have Pshat of Pshat, Remez of Pshat. etc.—a fractal structure. On a broader scale, God created a man and woman in His image. He further commanded them to procreate. This has set off the ever-growing, ever-branching tree of humanity. As Benoit Mandelbrot explained, a fractal is a “shape having the property that each small portion can be viewed as a reduced scale replica of the whole.” When looking at a person, no matter how small, we should never forget that this is a miniature replica of God. Let’s show some respect! No wonder that the physical world, reflecting its spiritual origin, exhibits fractal patterns . Whereas the nature furnishes plentiful examples of fractal patterns in space, the Torah shows us a unique fractal pattern in time and in the spiritual domain.